We were appointed to provide a full architectural service on this project in the form of a full planning application to Bradford council, followed by a very detailed package of working drawings, which were developed in conjunction with a specialist pile foundation company, due to the presence of some ancient lime kilns under the site. Full planning permission was granted by Bradford planners in September 2011, and building work is due to start before the end of 2011. The site lies on the banks of the Leeds-Liverpool Canal in a picturesque setting. The site is currently occupied by some unsightly 1960′s built pre-fabricated garages which make no significant contribution to the area. The site boundary fronting the canal actually forms the boundary of a conservation area, and as such, we considered it was important for this new house to make a bold architectural statement. The immediate area of canal towpath around the site is well-used by walkers and people enjoying the local countryside, and consequently we saw this project as an opportunity to create a landmark dwelling. 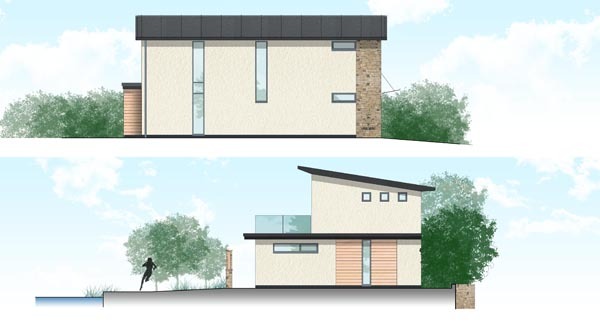 The site has a previous outline planning approval for a rather drab and uninspiring stone built, pitched-roof bungalow, and following our appointment on this project, we set about designing something which we considered to be more appropriate for its location. The client knew that he wanted to steer away from the previous design towards something striking and contemporary, and he appointed our services in order to try and achieve this. The outer shell of the dwelling briefly consists of a natural yorkshire stone facade fronting the road-side, with rendered walls and cedar cladding to the other outer walls, large amounts of aluminium framed glazing to the canal side, a curved timber clad projecting bay to the lounge area, as well as a structurally glazed corner window in the lounge, a balcony with glass balustrading to the canal-side and a metal standing seam monopitch roof. 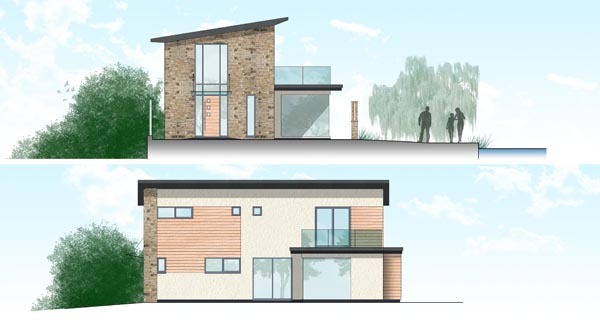 We are eagerly awaiting building work to start on this project, and will be providing regular updates in our blog section over the coming months.